7-ingredient vegan, gluten-free cheesecakes that are creamy, slightly tart, perfectly sweet, and 100% irresistible. Better than real cheesecake and the perfect healthy, simple dessert to feed a crowd (or just you). Add dates to a food processor and blend until small bits remain and it forms into a ball. Remove and set aside. Next add nuts and process into a meal. Then add dates back in and blend until a loose dough forms - it should stick together when you squeeze a bit between your fingers. If it's too dry, add a few more dates through the spout while processing. If too wet, add more almond or walnut meal. Optional: add a pinch of salt to taste. Lightly grease a standard, 12 slot muffin tin. To make removing the cheesecakes easier, cut strips of parchment paper and lay them in the slots. This creates little tabs that makes removing them easier to pop out once frozen. Next scoop in heaping 1 Tbsp amounts of crust and press with fingers. To pack it down, use a small glass or the back of a spoon to compact it and really press it down. I found the bottom of a glass works well. If it sticks, separate the crust and the glass with a small piece of parchment. Set in freezer to firm up. Add all filling ingredients to a blender and mix until very smooth. For the coconut milk, I like to scoop the "cream" off the top because it provides a richer texture. But if yours is already all mixed together, just add it in as is. You don't need a Vitamix for this recipe, just a quality blender. I mixed mine for 1 minute, then "liquified" or "pureed" it until silky smooth. If it won't come together, add a touch more lemon juice or agave or a splash more coconut milk liquid as the liquid should help it blend better. Taste and adjust seasonings as needed. If adding peanut butter, add to the blender and mix until thoroughly combined. If flavoring with blueberry or caramel, wait and swirl on top of plain cheesecakes (optional). Divide filling evenly among the muffin tins. Tap a few times to release any air bubbles, then cover with plastic wrap and freeze until hard - about 4-6 hours. Once set, remove by tugging on the tabs or loosening them with a butter knife. They should pop right out. Our favorite way to devour these was with a little more caramel and a touch of coconut whipped cream. But they're perfect as is! Keep in the freezer for up to 1-2 weeks. Optional: You can set them out for 10 minutes before serving to soften, but I liked them frozen as well. *If your dates are not sticky and moist, you can soak them in warm water for 10 minutes then drain. But be sure to drain thoroughly and pat dry to prevent the crust from getting soggy. *To quick-soak cashews, pour boiling hot water over the cashews, soak for 1 hour uncovered, then drain and use as instructed. *Nutrition information does not include toppings or added flavors. 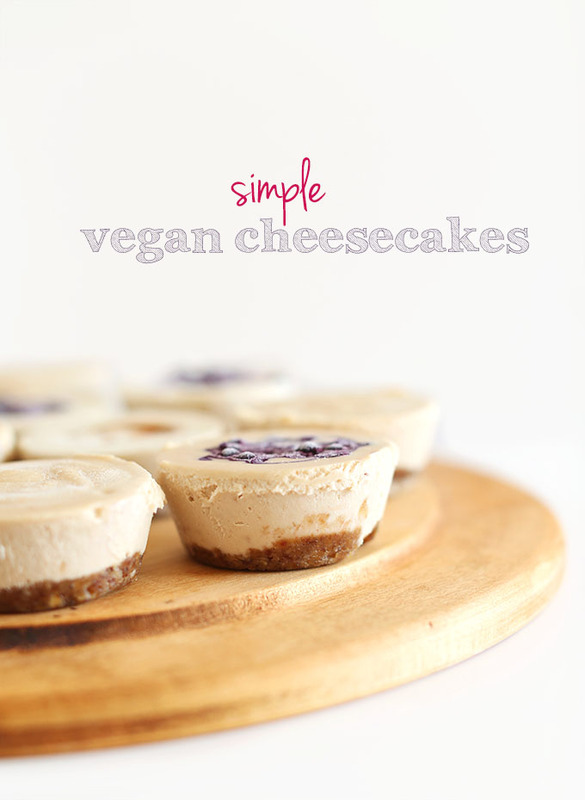 0 Response to "7-INGREDIENT VEGAN CHEESECAKES"